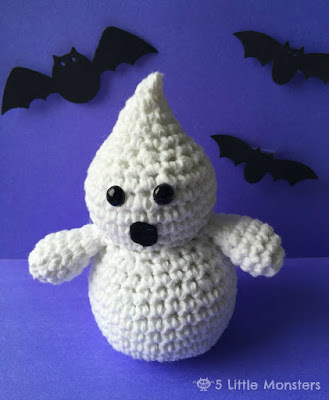 This little ghost is only about 6 inches tall so it is perfect for a quick project. Poly pellets inside give it a weighted base so it stands up on its own. Safety eyes and a felt mouth make the face. 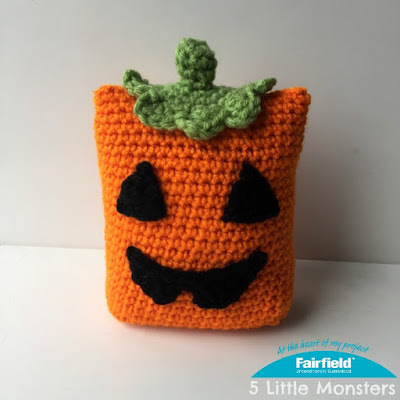 This Jack-O'-Lantern is part of a series of three Boxy Halloween Buddies. It also has a weighted base to help it stand on its own. 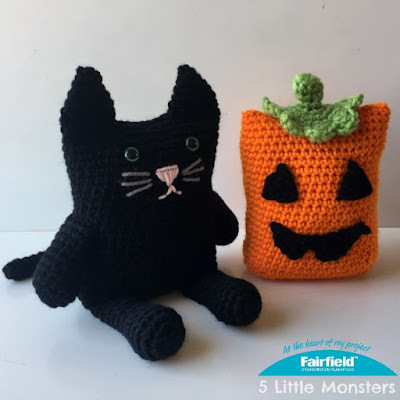 Leave the face off to make a boxy pumpkin instead. 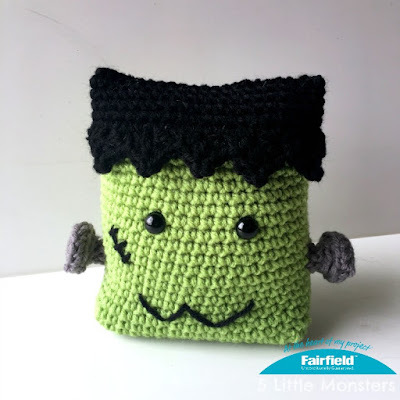 Second in the Boxy Halloween Buddies is Frankenstein. He has black hair made with a pointy shell stitch edging, screws that are sewn on at the end and safety eyes and embroidery to make the face. Completing the trio is a black cat. Like the others it has a weighted base and arms legs and a tail that are crocheted into the body, the ears are sewn on later. The face is embroidered with safety eyes. 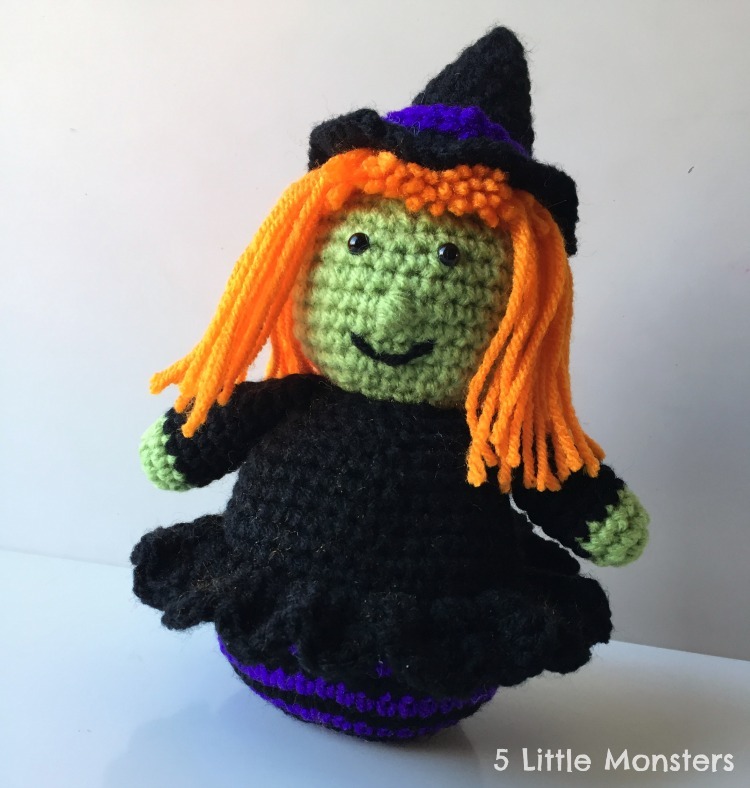 Crochet a not-so-scary witch with this pattern She has a black dress and pointy hat, orange hair, and green skin. She also has a poly pellet base to help her stand up on her own and she will be a fun addition to your halloween decor. 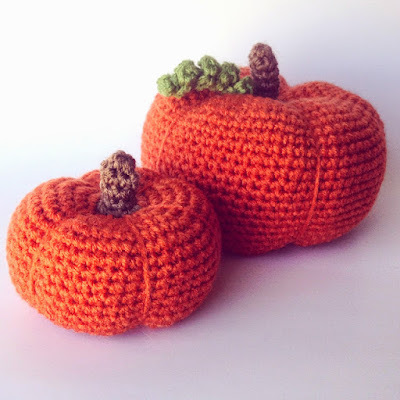 One of my earliest patterns was this set of small crocheted pumpkins. It can be used for Halloween and all throughout the fall. 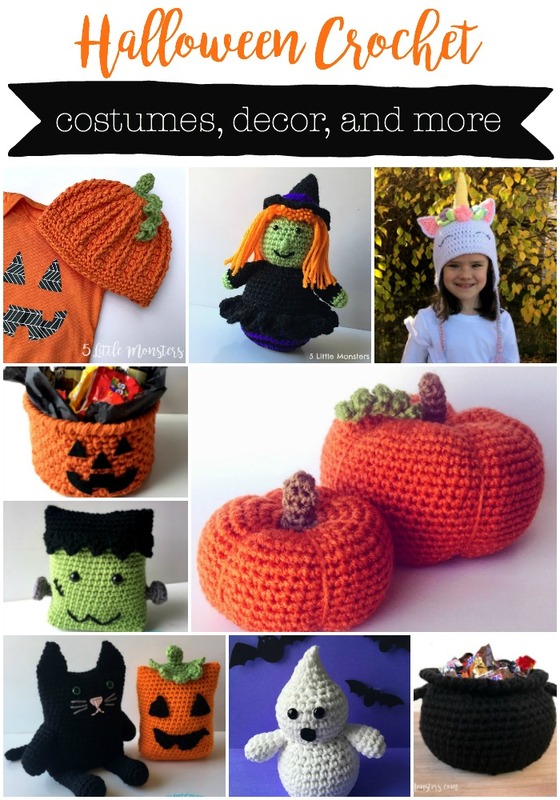 It continues to be one of my most popular post every fall. They are about 4 and 5 inches tall. 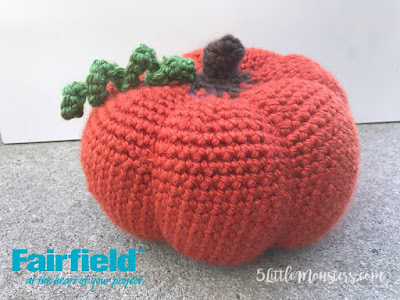 This large pumpkin is base on the pattern for the smaller pumpkins but it is larger and made with bulky weight yarn. The thick yarn makes it go quicker than you would think for the size. It is about 7" tall and 11"in diameter. The pattern could easily be adapted to make a larger or smaller pumpkin. 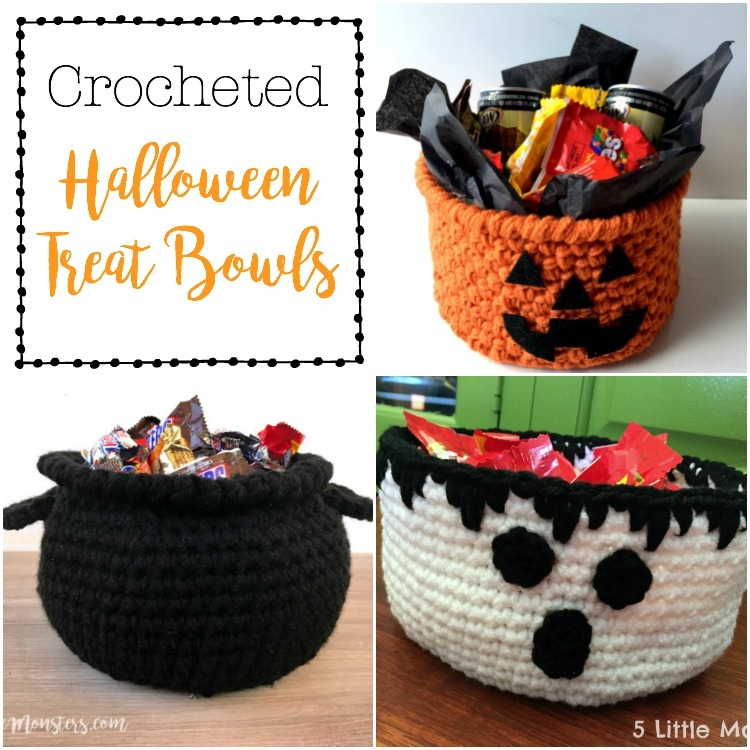 This crocheted pumpkin basket has a felt Jack o' Lantern face and is perfect for filling with treats to give as a gift or using as a candy bowl to pass out to trick-or-treaters or set out for visitors. Multiple strands held together make it nice and sturdy. 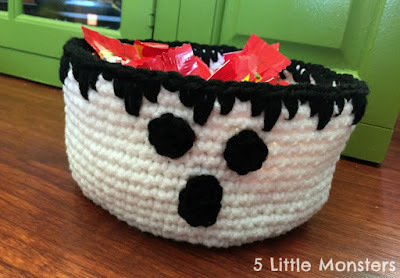 Make a spooky ghost bowl to fill with treats this halloween. Spike stitch worked along the top edge for a border. The face is made of crocheted circles that are sewn on at the end. 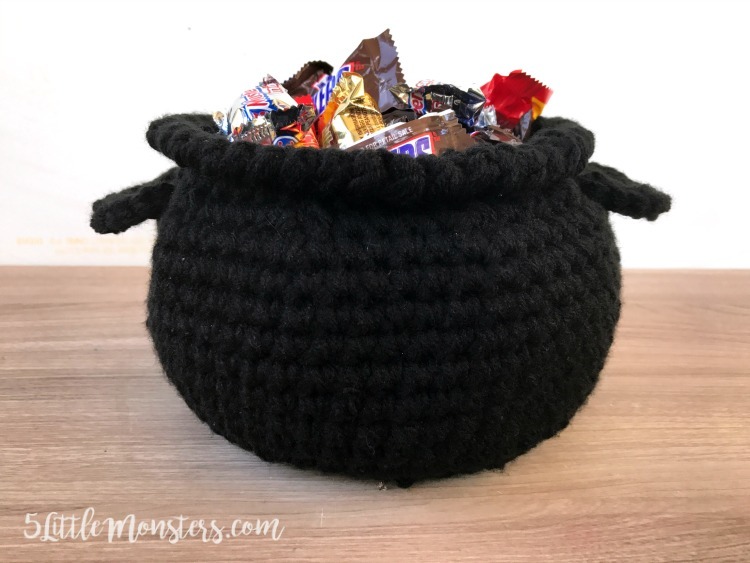 This is probably my favorite of the treat bowls I have made. It looks like a small witches cauldron and is perfect for passing out candy or setting out as a treat bowl. My husband took it to work to set on his desk and it was the perfect size for that. 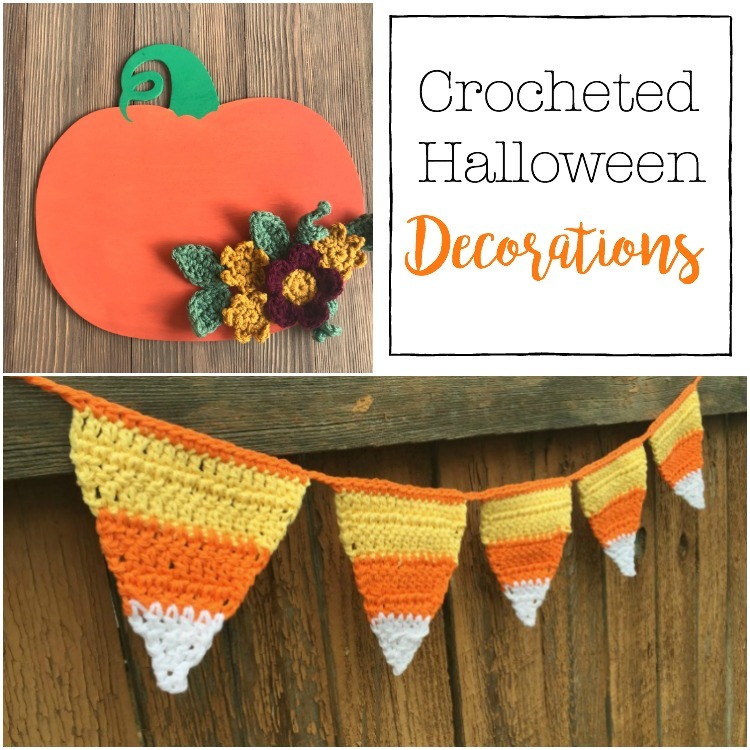 This candy corn bunting with add a fun touch to your decor. 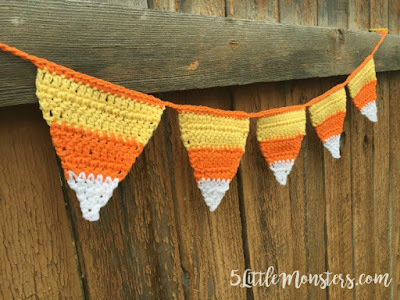 It is made with triangles crocheted in the colors of candy corn and stitched together to make a bunting. 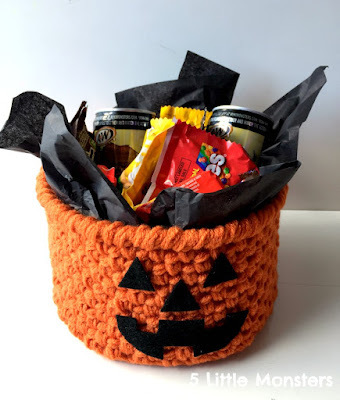 Individually the candy corns could be used for coasters as well. Combine wood and paint with crochet in this project. 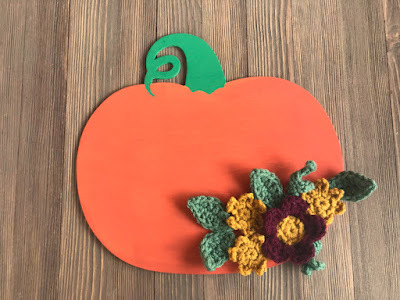 A wooden pumpkin is painted and then embellished with crocheted flowers in fall colors. 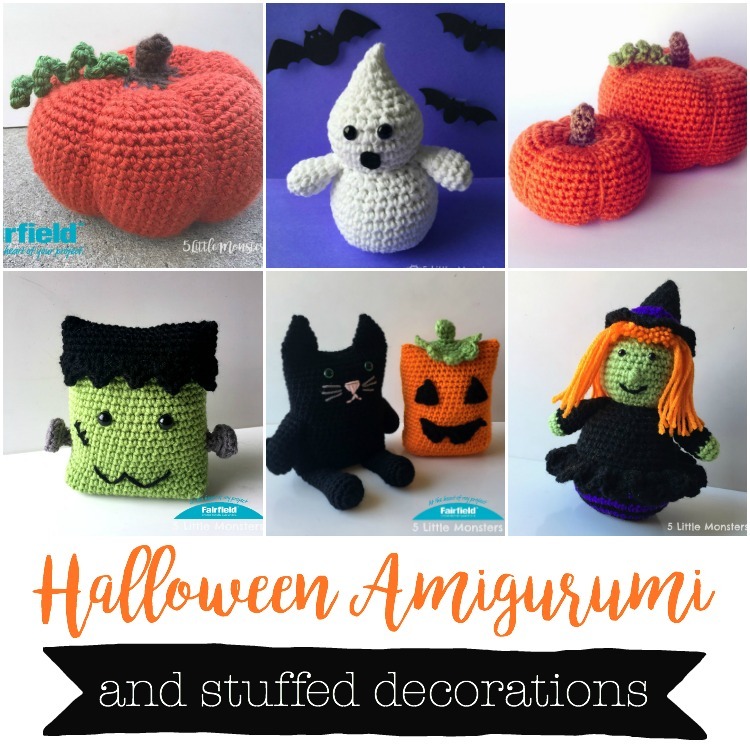 This project is great all through the fall, not just for Halloween. 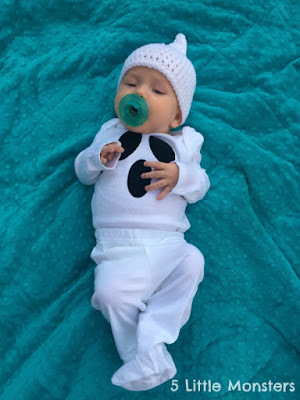 This little ghost costume was made with a white onesie and pants, a little bit of iron on vinyl for the face (you could also use felt or fabric), and a crocheted hat. 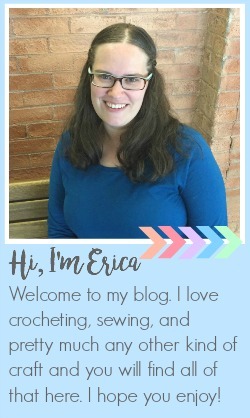 The hat is made to fit a baby that is around 0-3 months. 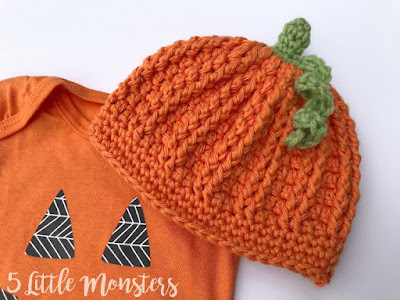 This little pumpkin hat is a 0-3 month size and uses post stitches to create the bumpy pumpkin texture. Pair it with a Jack-O'-Lantern onesie for a super easy costume for baby. 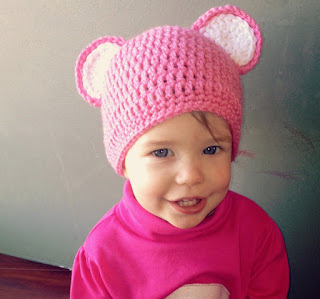 This toddler sized bear hat is perfect for a Care Bear costume, or make it in brown for a regular bear. We paired it with a shirt that we added a felt belly badge to for an easy DIY costume. 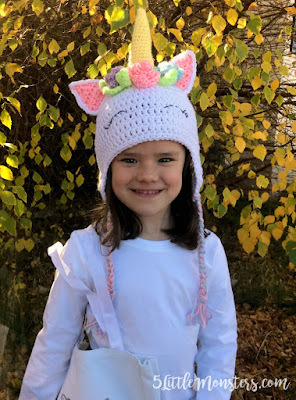 My daughter used this unicorn hat as part of her halloween costume and then continued to wear it all through the winter. 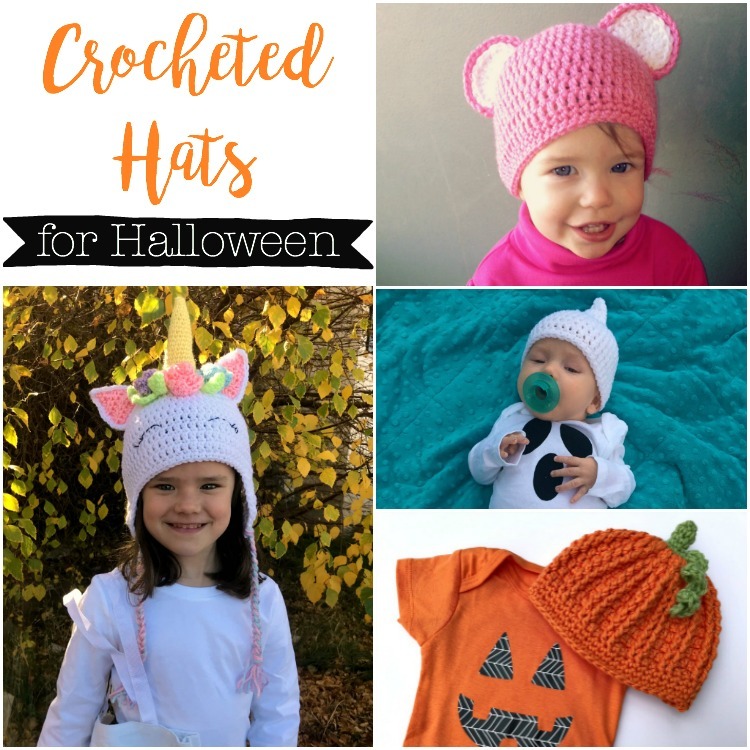 It is a fun hat whether it is used as part of a costume or not. I 'd produce connection that the sizable majority folks buddies unit endued with to unit getable at intervals the simplest place with heaps of exquisite those who have really useful things.